A few weeks back, I received an email from a reader with some brief details about his family's history, starting with emigration from England to Australia in 1870, through to the present day. He asked if I would be interested in reading more of it, and I am glad that I agreed, because it is emblematic of many such stories. Many of us don't have this level of detail about our families, unless, like my correspondent Anthony, we are prepared to do the necessary research. Anthony had thought that his grandfather arrived in Australia as an orphan after WWI, but found out otherwise. This is the story of the Waters family, as uncovered by Anthony Waters. The story reaches across six generations, so I'm splitting it into two instalments, starting today and concluding in our next post due out on Friday. In the late 1860s, Fredrick Waters was a porter on the docks in London. He had a hand barrow, and he would contract to transport luggage and goods from the docks on the River Thames, on foot, all over London. 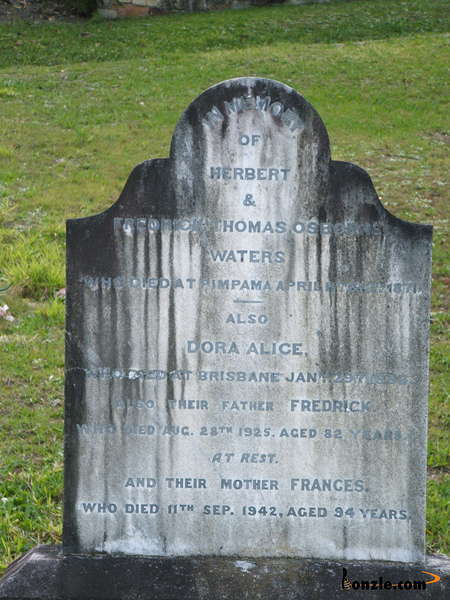 He was 25 years old when, in March 1869, his wife Elizabeth Waters died whilst delivering their second child, a son named Frederick Thomas Osborne Waters. Father Fredrick was left with a two year-old daughter, Eliza, and the baby to care for, at the same time needing to work at the docks. A nanny, Frances Amies, was employed to care for the children in their home in the London suburb of Hackney, thereby allowing Fredrick to continue his carrying business. The nanny proved too good to let go, and Fredrick married her in September 1869. By 1870 the Waters family, now numbering five following the birth of Herbert to Frances and Fredrick, were in the fledgling settlement of Brisbane, having emigrated on the ship Light Brigade. Fred brought his tool of trade, the hand barrow, with him on the voyage. A Magisterial inquiry was held on Thursday, before Mr J. Gibson, at the residence of Mr F. Waters, Pimpama, touching the death of a little child, the son of Mr Waters, who died suddenly two days previously. The evidence was to the effect that the child had died from water on the brain. At the conclusion of the inquiry Mrs Waters intimated to the presiding magistrate that she had another child sick, and she would like him to see it. They adjourned to the adjoining room, and no sooner had the mother entered it than she exclaimed, "The child is dead!" On examination, this was found veritably to be the case, the poor little sufferer, a boy about two years old, having apparently breathed his last about an hour previously. It is almost unnecessary to say that the greatest sympathy is felt for the parents. Shortly after the boys' deaths, Frances, evidently and understandably in a state of depression after losing both her son and her step-son within a couple of days, was "severely reprimanded" by the plantation's owner, a Major Boyd, for her melancholy disposition, as reported to him by Frances' supervisor. Enraged by this, Fred settled the matter with the supervisor using his fists, causing the supervisor to have to "take to his bed for a period of six days" according to the Police Gazette. While they were building businesses, Fredrick and Frances were building a family, in all producing thirteen children. The youngest of the children was Anthony's grandfather, Edward Harold Waters, who was born in 1895. Fred Waters established his furniture factory in the back of the old jail on Petrie Terrace. The jail had been vacated on the completion of the new facility at Boggo Rd, and so was being used for other purposes. About half-past 2 yesterday afternoon the Metropolitan Fire Brigade received a call from Mr Ayscough, chemist, to a fire on Petrie-terrace, and the firemen with the superintendent and two reels, proceeded to the spot at once. On arriving they found two wooden buildings occupied by Mr Fred Waters, furniture dealer, at the rear of the old gaol, fairly ablaze, while the adjoining building was also well alight. One of the two buildings was Mr Waters’s furniture shop and the adjoining one was his residence with stables, offices &c. Both buildings were completely destroyed, and unfortunately for the owner the furniture was only insured for the sum of £100 in the Commercial Union. The adjoining house was owned by Bridget Cahill, confectioner, and was insured in the South British Company for £250 and a portion of it was let to Mr George H Cameron. The ceiling of this building was burned somewhat, and the furniture suffered both from water and from hasty removal. The next building was occupied by Legg and Co., tailors, whose stock and furniture were, it is believed, uninsured, and both roof and ceiling were destroyed and the contents damaged by water. In the next building, owned by Mrs (Dr) Comyn, the line roof and ceiling were slightly damaged. A strong north-easterly breeze was blowing, which made the work of extinguishing the flames extremely difficult and no fewer than eight buildings caught fire from the sparks and had to be extinguished. In one instance a house caught fire at a distance of no less than 200 yards from the main conflagration. The South Brisbane Fire Brigade was summoned, and sent a reel, under the assistant superintendent; and a member of the Milton Fire Brigade also gave assistance. The fire originated in the back premises of Mr Waters, but the cause of the fire is unknown. Immediately on the fire being made known at Victoria Barracks, the trumpeter was ordered to sound the fire alarm call, followed by the “Double”, and in a few moments the men of the Permanent Artillery were out on parade with hydrant and hose. They proceeded at the “double” to the scene of the fire, and with their own appliances set to work to cope with the flames. Those men who were not needed for the hydrant were placed at the disposal of the superintendent of the Metropolitan Brigade. Very good work was done by Sergeant Smith (of the Royal Marine Light Infantry), who form the ridge-capping of one of the houses handled the nozzle of the barracks hose. The men were under Master Gunner Cooney and Quartermaster-sergeant Newton. About twenty-five men of the Permanent Artillery were in attendance. Both Fire Brigade and Defence Force men deserve every credit for their work in stopping the fire before it reached the corner of the street.